This unique heart tattoo includes a heart in the shape of a padlock, with green leaves in the background. This brand spanking new heart tattoo uses a popular image of a heart designed like a padlock, while simultaneously making the heart locket look like a flower with green leaves sprouting from behind. Locket heart tattoos are especially common for girls because they represent the idea that you have to win over a girl by “unlocking” her heart. This heart tattoo in particular is beautifully inked on this girl’s body, and, although the padlock tat is relatively large, it still looks cute and feminine. 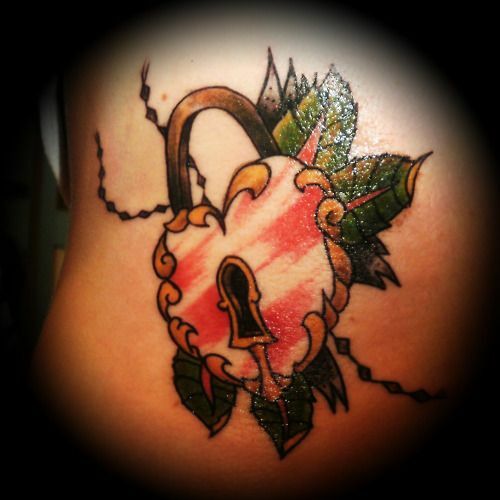 Locket heart tattoos like this one evoke an almost whimsical response, indicating that only one person, the holder of the key, can gain access to the girl’s heart.